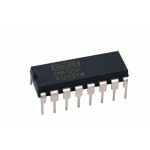 Purchase online INA122 Intrumentaion Amplifier in India at low cost from DNA Technology, Nashik. 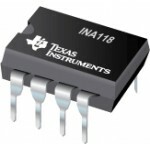 INA122 is a precision instrumentation amplifier for accurate, low noise differential signal acquisition. Its two-op-amp design provides excellent performance with very low quiescent current, and is ideal for portable instrumentation and data acquisition systems. The INA122 can be operated with single power supplies from 2.2 Volt to 36 Volt and quiescent current is a mere 60 mA. It can also be operated from dual supplies. By utilizing an input level-shift network, input common mode range extends to 0.1V below negative rail (single supply ground). A single external resistor sets gain from 5V/V to 10000V/V. Laser trimming provides very low offsetvoltage (250mV max), offset voltage drift (3mV/°C max) and excellent common-mode rejection. Package options include 8-pin plastic DIP and SO-8 surface-mount packages. Both are specified for the –40°C to +85°C extended industrial temperature range.